Chevy Bolt EV autonomous test car spied with hands-off pilot | Car News, Reviews, & Pricing for New & Used Cars. General Motors and its Cruise automation subsidiary have been steadily working to release a fully autonomous car in the near future, one that wouldn’t even have back-up controls. There have been a few prototypes running around, and most of them look like regular Chevy Bolt EV electric cars with extra sensors on top. One of our spy photographers caught this Chevy Bolt EV prototype driving around with the driver very clearly not touching the steering wheel. In fact, the driver’s hands are busy with a cell phone. It’s a bit disconcerting, since the driver appears to have the phone sideways with both hands on it, almost as if he’s playing a game or tapping out some text messages. Hopefully what he’s doing is actually related to the actual task of driving – he could be recording video of something to share with the testing team, or maybe monitoring something related to the car. Regardless, the fact that he doesn’t have his hands on the wheel makes it clear this is some kind of self-driving Bolt. It’s a Bolt with styling unlike other Bolts, too. Most of the nose is completely flat with only a slight bulge. 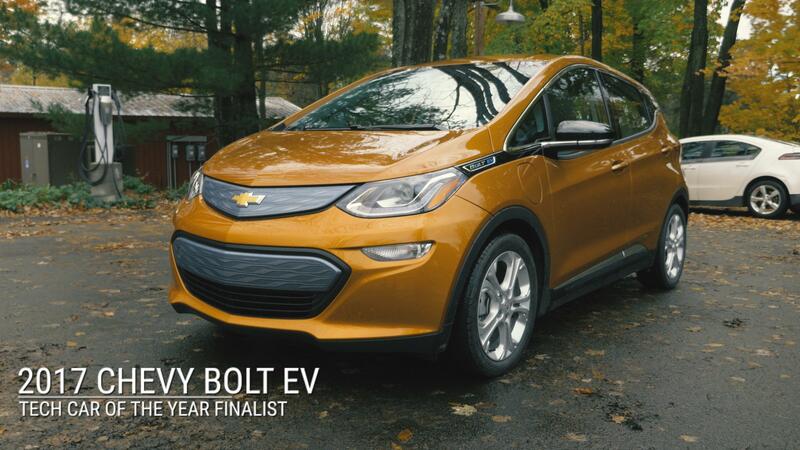 It has a few openings for air, but none are as large as that of the regular Bolt EV. The rest of this prototype is just like the regular version, with the exception of several antennae on the roof. We may see the production version of this car in the very near future, as GM has stated it plans to release fully autonomous cars into a car-sharing service in 2019. The production model will not have pedals or a steering wheel for manual control. The company has stated that all redundant safety features and collision protection equipment for the car are ready, too. When it is launched, it may be called the AV1, a tribute to the company’s first electric car, the EV1.